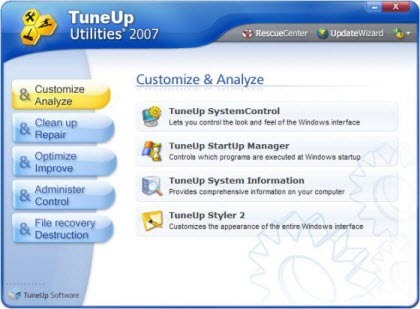 TuneUp Utilities 2009 is now available for download but costs $49 for the full version, if you are looking for a free alternative you can grab a fully functional free genuine license for the earlier version TuneUp Utilities 2007 of this popular Windows optimization application suite. This special offer is sponsored by Vnunet, all you have to do is to download the application from this link and Register the application with your name and special serial number - JMNCG-FKNGR-WMAMT-FRTQL-BLYJB-XDYMX, add to that you can also upgrade to the latest TuneUp Utilities 2009 version at the special discounted price of $29.95. You told me about the Link to a Fre version of TuneUp Utilities 2007. I looked and Looked and seen it Below and it sis not work, Is this a Come a Long? and use the key provided above (MNCG-FKNGR-WMAMT-FRTQL-BLYJB-XDYMX) to register. How about Tune up Utilities 2008 Genuine Registration Key?